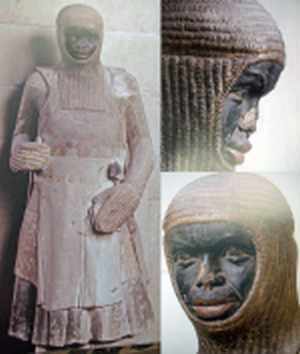 St. Maurice is commemorated throughout churches in modern Germany as a black African dressed as a Roman Solider. That depiction originated with the renowned statue in the Cathedral of St. Catherine and St. Maurice in Magdeburg, Germany. However, according to some historical authorities, he was probably not black and possibly never existed. What is known is the date he became a saint and when he first became depicted as black. In 287 AD, a Theban Legion of Christian Roman soldiers in Egypt led by Maurice was commanded by Emperor Maximian Hereculeus (ca. 250-ca. 310 AD) to march to Agaunum, now the modern day St-Maurice en Valais in Switzerland. Exactly what Maurice’s Legion was ordered to do there by the Emperor is disputed: they were either required to participate in pagan rites or to harass and kill local Christians. As a faithful Christian, Maurice led the Theban Legion in refusing to obey the Emperor’s commands. In response the Emperor punished the rebellious soldiers by dividing them into groups of ten and selecting one soldier from each group to be killed. When they continued to refuse the Emperor’s order, the remaining soldiers were again divided by ten with every tenth man selected for execution. When the soldiers continued their defiance of the Emperor’s orders, he, frustrated at their ongoing resistance, had the entire Legion killed. The earliest written accounts of this incident appeared nearly 150 years later, by which time the Church had declared Maurice a saint for his defiance of the Emperor’s orders. Although many historical authorities claim the entire episode is a pure fabrication of Medieval Christian Church leaders, the image of a Christian solider refusing to denounce his faith and defying a pagan Emperor resonated with Medieval Christians. To them Maurice’s sainthood was well deserved and the Church correctly venerated him. Maurice later became the patron saint of the Holy Roman Empire and an altar dedicated to his memory was placed in the Vatican. Until the mid-thirteenth century St. Maurice was depicted as a white Roman solider in full battle dress. Following the refurbishment of Magdeburg’s Cathedral in 1240-1250 after it was damaged by fire, he was portrayed as a black African. Why an unknown artist purposely changed the racial identity of Maurice is unknown. Some have speculated that because he and his men were from Thebes in Upper Egypt and near Nubia, they were considered “Ethiopians” which in the Medieval European world was a generic description of all dark skinned people on the African continent. Whatever the reason, the change marked the first artistic depiction of a black African in Medieval Europe. The black St. Maurice iconography spread across German states but not across all of Europe. In churches in modern Germany the image of the black St. Maurice endures while in churches in Switzerland, France, and Italy he continues to be depicted as white. Gude Suckale-Redlesfen, The Black Saint Maurice (Houston: Menil Foundation, 1987); Henry Louis Gates, Jr., and David Bindman (editors), The Image of the Black in Western Art, Volume II, Part 1, From the Demonic Threat to the Incarnation of Sainthood (Cambridge, MA: Harvard University Press, 2010).